Edited by Stanley Yates. Solos, Style, Perfect binding. 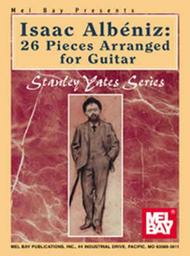 Stanley Yates Guitar. Classic. Book. 192 pages. Mel Bay Publications, Inc #97344. Published by Mel Bay Publications, Inc (MB.97344). ISBN 9780786649358. 8.75 x 11.75 inches. Transcribed by Stanley Yates. 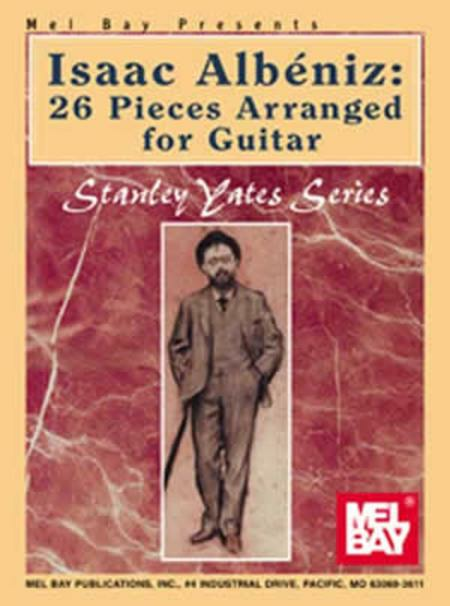 This comprehensive edition brings together all of the standard pieces in the adopted Albeniz guitar repertoire along with additional pieces that complete many of the suites and other groupings as published during the composer's lifetime. These solo arrangements were made while consulting the earliest editions of the piano originals, and are faithful to Albeniz tempo indications, dynamics, phrasing slurs, and other expression markings. The selections are: Pavana-Capriccio, Op. 12 (1992); Suite espanola, Op. 47 (1886); Recuerdos de viaje, Op. 92 (1888); Doce piezas espanolas, Op. 164 (1889); Espana, seis hojas de album, Op. 165 (1890); Serenata espanola (Cadiz, cancion), Op. 181 (1890); Mallorca, barcarola, Op. 202 (1890); Zambra granadina, danse orientale, WoO (1891); Cadiz-gaditana, WoO (1891); and Chants d'Espagne, Op. 232 (1891-1894). Carefully researched and meticulously fingered in the scholarly manner one would expect from Stanley Yates.